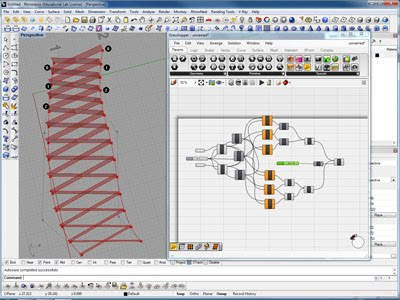 This tutorial explains how to create a parametric diagrid using two control lines. 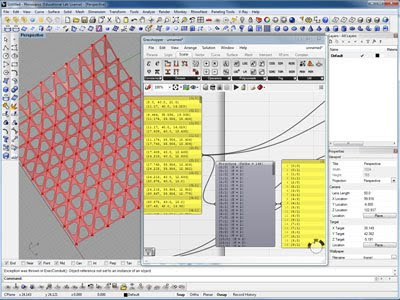 Furthur explains the use of the N item select tool - for selecting a specific item from a list. This is a remake of an old tutorial - as the data structures in the most recent version (06.0059) of grasshopper have changed - and the old way of constructing this surface will no longer work. This is a good beginning coverage of the parameter viewer tool and dealing with data trees - shows how you can use the tool for splitting a longer list of paths into smaller ones. For reference you can upload the definition here.